"Five of the past six months have reported single digit sunspot means; this is roughly similar to the first half of 2008. 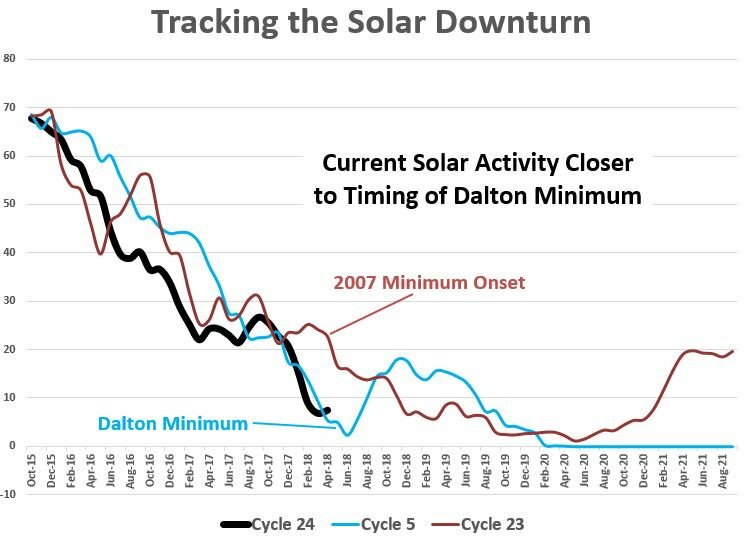 However, the downward slope is stronger like cycle 5 of the Dalton Minimum (early 1800s)." "Official" forecasts of the solar cycle come from NOAA's Solar Cycle Prediction Panel–a group of experts from NOAA, NASA, the US Air Force, universities and other research organizations. They have been convening at intervals since 1989 to predict the timing and intensity of Solar Max. The problem is, no one really knows how to predict the solar cycle. The most recent iteration of the panel in 2006-2008 compared 54 different methods ranging from empirical extrapolations of historical data to cutting-edge supercomputer models of the sun's magnetic dynamo. None fully described what is happening now. Human hubris knows no bounds. When the results don't meet up with the agenda hypothesis, the results are wrong. Feynman was an interesting guy. Got a set of his red lecture books on the shelf. I am getting ready for the mini ice age.